Shop the Best Price Beds range of Relaxsan mattresses. High quality comfort that guarantees a great nights sleep. The Relaxsan mattress is made by an Italy company based in Tuscany, Italy. They've been producing mattresses to a high-quality and supplying over 72 countries for the last 50 years. In 1997, they introduced the Relaxsan mattress range to the UK with marked ... Read more >success. 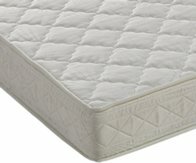 Relaxsan mattresses have built a reputation for quality and comfort delivered at a very fair price. Conforming to all international trade and quality standards, Relaxsan mattresses represent excellent value for money and an undeniable quality that supports you throughout the night for a relaxing and refreshing sleep. Backed by a 12 year warranty, Relaxsan mattresses are the perfect addition to your bedroom. With Teflon coating and a range of special fibres they're fire resistant, hygienic and extremely durable. Browse the range of Relaxsan mattresses available to buy online with Best Price Beds and order online today for free delivery.